NYC, 02/28/2019, 3:00PM. 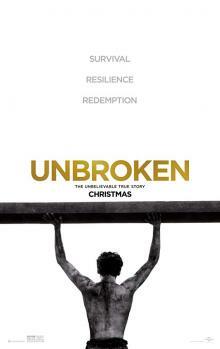 Unbroken (2014): Three time Oscar nominated war movie based on a true story by Angelina Jolie. 137 min. Director: Angelina Jolie. Starring Jack O'Connell, Miyavi, Domhnall Gleeson. Unbroken had three Academy Awards nomination for Best Cinematography, Best Sound Editing and Best Sound Mixing. The script was written by the Coen brothers, Richard LaGravenese, and William Nicholson, based on the 2010 non-fiction book by Laura Hillenbrand, Unbroken: A World War II Story of Survival, Resilience, and Redemption. Unbroken grossed $115.6 million in the U.S. and Canada and $47.6 million in other territories for a worldwide total of $163 million, against a budget of $65 million.